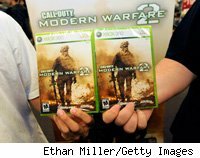 Should Activision Blizzard (ATVI) have delayed the release of Call of Duty: Modern Warfare 2, perhaps the most eagerly anticipated video game of the year, while the memories of the massacre at Fort Hood are still fresh? Maj. Nidal Malik Hasan, an Army psychiatrist, allegedly shot 13 people at the Texas military base last week. Law enforcement officials are probing Hasan's ties to terrorist organizations. President Barack Obama and first lady Michelle Obama are attending memorial services for the fallen at the base today. With all of this in the background, the timing of the game's launch seems tacky. Maybe Activision could have waited until after Veterans Day tomorrow. Maybe there is no good time to release the game. After all, the casualties from Iraq and Afghanistan continue. The latest figures show that 4,360 troops have been killed in Iraq and 907 in Afghanistan, More than 35,0000 have been wounded, according to the Department of Defense. And the group The Veterans of Foreign Wars estimates that since 9/11, more U.S. military personnel and veterans have committed suicide than the total U.S. dead from the wars in Iraq and Afghanistan combined. The massacre at Ford Hood occurred at a processing center for troops going to or returning from Afghanistan, a war theater being pictured in vibrant graphics and realistic sound in the latest version of Call of Duty. The result is awesome, according to game reviewers. "But can it possibly hope to live up to the ludicrous expectations heaped upon it?" asks the U.K.'s Telegraph newspaper. " In a word, yes, and however irksome the submit-or-die nature of the publicity swirling around its release may be, Call Of Duty: Modern Warfare 2 really is one of the best video games released all year." Indeed, CNBC estimates that 5 million copies of the game will be sold, generating $300 million in retail sales. That's huge, but you wouldn't know it by the company's stock price. Shares of Santa Monica, Calif.-based Activision Blizzard are trading down from their recent Oct. 8 peak of 12.96, though they are up about 32% this year. Activision is not oblivious to the criticism leveled at shooter games. The company donated $1 million to help veterans find work through a new endowment. But these types of video games are not inherently evil. "Some of these games can certainly hold some educational value," said Jerry Newberry, director of communications for the VFW in an interview, adding that others have "gratuitous violence."